For me, one of the most discouraging things about being pro-life is seeing what other people think of the abortion issue and how cavalier or celebratory they are with regards to issues surrounding the grossly misnamed "reproductive freedom" issue. I just can't understand how someone, even someone who supports abortion in most cases, can be happy about the fact that abortions occur at all. Whether you are pro-life or pro-choice, is it not a tragedy when someone decides that they aren't able or don't want to help their own family live? Mom's having abortions because they can't afford their children, or because they found themselves in a situation where they don't want to be attached to the father, or because their family or partner is not supportive of any choice other than abortion, or because they aren't given the resources necessary to raise a special needs child. The fact that abortion happens is not a good thing. This is our culture refusing to help mothers and children in need, and pushing a "quick fix" solution towards moms who find themselves in less than ideal circumstances. The existence of abortion is a tragedy. Free abortion for all women - yay!! This isn't about killing our children, no, this is about having freedom! This isn't about helping women and children escape their circumstances, no, this is about having rights! How do you convince people that they support something that has caused the deaths of billions of people? How have we gotten to the point where this is even something that has to be done? Sometimes this world is just so discouraging. At least things like this really highlight how necessary it is for those of us who are pro-life to speak up and engage our peers. It can be so difficult to do sometimes, but it is so, SO necessary! Such a sad law... and even more sad that people celebrate it. Hopefully France has also made it "free" to get sterilized or have prenatal care or give birth or raise kids. 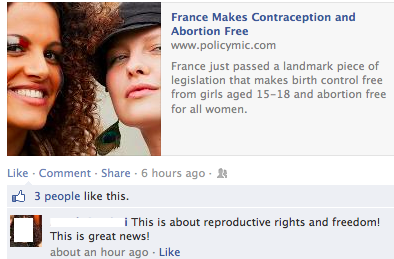 You say it well - since when did even pro-abortion-rights people want to celebrate abortion? We should be focused on why women are getting abortions and solving those problems, not just putting a bandaid on a festering wound. I know, I get disheartened by the same kind of thing! I've had to stop reading the Live Action blog because there were so many cold comments by abortion supporters. Quote of the Week: "My baby's alive"